In Nicaragua yesterday, July 17, the State celebrated el Día de la Alegría, the national Day of Joy which celebrates the day in 1979 when the dictator Anastasio Somoza Debayle fled the country. In Nicaragua yesterday, July 17, the State sent its soldiers and paramilitaries into Masaya, the protest or rebel city, and “regained control.” The cost of control, extracted over the past three months, is more than 300 dead and untold injured, wounded, scarred, violated, tortured, and traumatized. This has been unfolding for the past three months and, until this week, the world press, and in particular the English language world press, has gone largely silent. The one exception has been Al Jazeera which, from the very start, seemed to sense that something was going on, and has had almost daily reports, often two or three a day. Yesterday, Al Jazeerareported on a march through Managua. 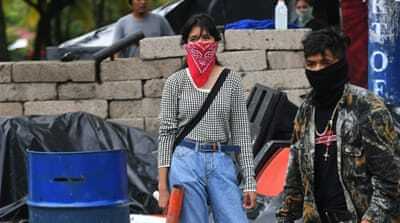 People demanded justice for victims in a scenario in which masked paramilitary forces are attacking barricades, churches, schools, communities, individuals, and justice itself. Another Al Jazeera report yesterday noted that the United Nations and much of the rest of the international community has called for a negotiated end to the violence, but there is no negotiation with masked parastatal agents who seek to terrorize not only the population but the very idea of negotiated settlement. Al Jazeera also updated its ongoing “Nicaragua unrest: What you should know”. You should know that the world has stood by while 300 people have been butchered. You should know that the world press largely stood by while 300 people have been butchered, and you should ask, “Why?” How many Nicaraguans must die before “pressure mounts on Ortega”? There’s much to say about what’s going on in Nicaragua, for example the role of women as leaders of the struggle for justice, but for now it’s important to say anything, to insist that our local and national and international news media do better, do something, do anything, because if they don’t, when the “international community” finally decides to “do something”, almost certainly that something will be military, which is precisely not what the Nicaraguans calling for Ortega’s resignation want. They want justice, not invasion. Perdido en la mitad del mundo? Dejando pisadas de agua por los montes? Verdes, enmarañados y llenos de palomas? —Gritos de mujeres, como de parto—? Sino puño crispado y bala en boca? green, tangled, filled with doves? screams of women as if in childbirth? clenched fist, bullet in the mouth? What are you, Nicaragua … and who is asking? Who hears the screams in the afternoon and who is paying any attention?